The small paws slam against the other side of the quarantine cage door, claws gripping the wire. Huffing two or three times, the bear cub struggles to maintain both grip and the ferocious attitude for another second or two before letting go. The two ears and twitching nose disappear from my view, followed by the light brown claws. A soft scuffing sound as the little bear lands back on the ground, and the bluff charge is over. I am elated. The cub stands hunched over, fuzzy bum turned towards me, and gives me a glowering look that quickly turns insecure and then fearful. I step back from the door, out of sight so I don’t further stress this bear, and hug myself. I’m smiling like a madwoman. Since starting as a volunteer at Northern Lights Wildlife Shelter in October I’ve discovered that a bluff-charging bear cub can give me a warm and fuzzy feeling. That’s because a bluff charge is not only a sign the animal has enough energy to try to protect itself, but has the will to live. It seems to me that finding the will to live is a very discernible decision with some of the orphaned bears. This little cub arrived at the shelter in early January a very weak state. She miserably rolled up with her back facing the door of the cage, and wanted nothing to do with food or her new environment. The philosophy of the shelter is to not unduly stress newly arrived animals and to build on the ability of the body to heal itself. Getting handled by humans is often traumatic for wildlife, so providing a quiet, dry, sheltered place helps reduce the stress the animal is experiencing. A vet gets called in if there are severe injuries or illness, but for the most part we just try to create a safe, peaceful environment and gently encourage the animal to build up its strength. The first sign this new cub was finding its will to live was the simple move of its head in the direction of warm, sweetened oatmeal. Slowly, ever so slowly the little bear sniffed at the bowl. I held my breath, waiting for the cub’s decision. Would it eat? Seconds passed, then finally the long tongue came out and the bear began to tentatively lick at the liquid. Did I put enough syrup in to make it enticing? Apparently I did, because the cub lapped up a few more sips before staring at us fearfully and rolling back into a ball. It’s been small steps since then, each one leading up to a major milestone though. It’s unclear how this bear came to be on its own, but it is obvious from its size that it must have been starving for a while. Taking in food now happens slowly. At first the cub only lapped up the liquid in the oatmeal, then began eating a few mouthfuls of the actual porridge. I was thrilled. Another milestone follows a day later when the bear gets up at the scent of oatmeal and begins to eat right away. It’s all slow motion movements that show how much effort it takes for the cub to stand and walk, to eat. I feel like we’ve hit a home run when the little bear decides it’s worthwhile to rearrange its bed of straw: bit by bit she rakes errant pieces on the floor onto the big pile that is her bed. Next the fruit smoothies I’m offering so the cub doesn’t have to spend energy on chewing are finally accepted. But it’s the bluff charge that feels like the all-clear signal on the road to recovery. 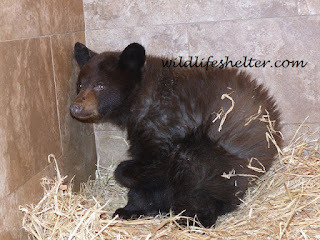 We've had another set-back with her since I first wrote this, but now the little bear is doing really well and has joined the other twelve black bear vubs who aren't hibernating in the outside enclosure. beauty is right! What an intriguing thought.